San Antonio’s best place to get your Bridal Jewelry is Atlantis Discovered. We carry Tiaras, Necklaces, Earrings, Bracelets and Gloves. Atlantis Discovered knows that your day is special, and should be unique. That’s why we carry so many different styles. Our styles change constantly. So often in fact that we can’t even offer it online, because it will be sold out in the store before we can get all the photos and pricing together. Please come into the store in San Antonio to see our latest inventory. 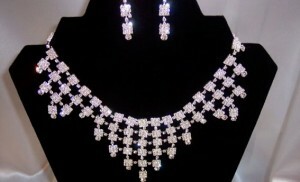 But be sure to visit our Bridal Gallery, to get an idea of the types of jewelry and accessories we carry.